(Top) Using optogenetics we can express light sensitive ion channels to activate and inhibit precise circuits in the brain in a temporally and spatially specific fashion, (Right) Animals are implanted with optic fibers which allows the light to be directed to specific brain regions. Using operant tasks we can manipulate cells at specific times by turning on the light source (typically a laser) during specific aspects of a behavioral task to determine the roll of specific cells in executing theses tasks. While DREADDs provide a powerful tool for changing neuronal excitability on a slow and long-term time scale, some forms of neuronal signaling occurs in a temporally specific manner, in order to test how the temporal specificity of signaling contributes to associative learning we use optogenetics. This technique allows for us to activate or inhibit specific populations of neurons at specific timepoints in specific brain regions (typically during the presentation of cues or rewards). This combined with operant tasks allows for us to have a precise understanding of how temporally and spatially signaling contributes to motivated behaviors and learning about cues and their predictive outcomes. 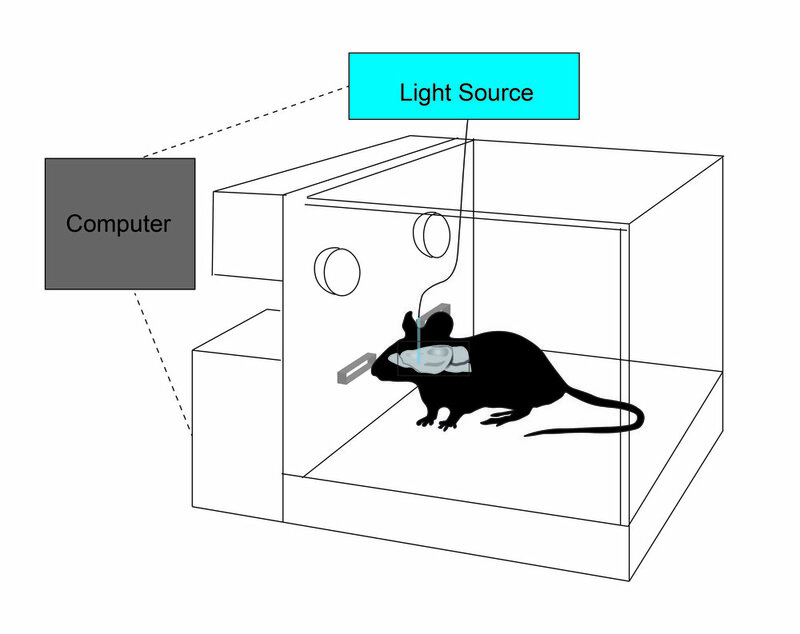 By combining optogenetics with operant conditioning animals can be trained to press a lever to receive optogenetic stimulation or inhibition of certain cell types or pathways. In these experiments, a lever press triggers a computer to activate a light source for a specified period of time. Thus, allowing operant control of activation and inhibition of defined cell types. While activating and inhibiting the neuronal activity of a pathway in response to salient stimuli is informative for understanding the temporal specificity of information encoding, it does not elucidate whether a pathway is rewarding/aversive on its own or imbues motivational value to predictive cues. By pairing optogenetic stimulation/inhibition of specific cell types and pathways with operant conditioning we can determine if the activation of a specific pathway is reinforcing or aversive.